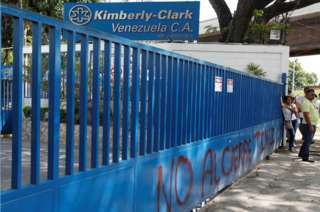 The government of Venezuela has said it has seized a factory owned by the US firm Kimberly-Clark. The firm had said it was halting operations in Venezuela as it was unable to obtain raw materials. But the labour minister said on Monday that the factory closure was illegal and it had re-opened "in the hands of the workers". Kimberly-Clark, which makes hygiene products including tissues and nappies, said it had acted appropriately. Over the weekend it became the latest multinational to close or scale back operations in the country, citing strict currency controls, a lack of raw materials and soaring inflation. General Mills, Procter & Gamble and other corporations have reduced operations in Venezuela as the country is gripped by economic crisis and widespread shortages of basic household goods. What has gone wrong in Venezuela? Labour Minister Oswaldo Vera, from the ruling Socialist Party (PSUV), visited the factory in Maracay and said it was illegal. Almost 1,000 workers had asked him to re-start production, he said. Mr Vera said: "Kimberly-Clark will continue producing, now in the hands of the workers. "We've just turned on the first engine." The Texas-based company said in a statement: "If the Venezuelan government takes control of Kimberly-Clark facilities and operations, it will be responsible for the well-being of the workers and the physical asset, equipment and machinery in the facilities going forward." There are daily protests against shortages at the moment in Venezuela. A growing opposition blames President Nicolas Maduro of wrecking the oil-rich economy and is seeking a referendum to remove him. Mr Maduro has previously threatened to jail the owners of factories that have stopped production. A private supermarket chain and an electronic goods shop have been seized in recent years after Mr Maduro accused many businessmen of conducting an economic war in collusion with the country's opposition.